2018 has treated us well. We certainly haven't been short of great new games to play, but there are always some exciting prospects that seem to go dark or slip off the radar. Sometimes teams are concentrating on making the actual game instead of teasing us with marketing materials, which is fair enough, but it's still useful to remember some of the cool games coming our way in 2019 and beyond, even if they haven't been much talked about this year. I can’t wait to see how the Company of Heroes developers tackle a very traditional series like this. CoH was all about combined arms, squad management, cover, destructible scenery, and tanks, little of which seems relevant to a shifting historical setting. Given that the original has already been remastered, I’d like to see Relic be bold with this one. We featured Bannerlord at the PC Gamer Weekender in 2016 and it appeared on our cover early in 2017. We’ve even played it, but there’s still no sign of a release plan. Beyond a series of blog posts detailing a few systems Bannerlord has been quiet this year. It feels like the game will inevitably do well when it’s released to the dedicated Mount & Blade following, but I’m especially keen to see what the game will become in the years after release as updates and mods deepen the sandbox. Anthem is EA’s massive punt at a Destiny style online looter shooter. For a game with those ambitions it’s remarkable how little the game has been shown and discussed in 2018. There have been a few developer-led livestreams and a trailer or two, but nothing that has set out Anthem as a long-term prospect for new players. This game is out in less than two months and there’s still so much we don’t know. Is EA planning a soft launch so that the game can grow gradually over time? That would be quite a gamble given that Destiny will probably move into its next major phase in 2019, and the Division 2 is approaching. We loved this when we played it in the IGF ages ago. It’s an exploration game set in a solar system full of lovingly designed planets. When I look at some of the worlds the devs have shown so far I get a little bit of Mario Galaxy buzz. I want to clamber into my spaceship and see every strange creature, space station, and astral phenomenon Mobius Digital has laid out for me. We’ve seen the odd trailer and screenshot of this one, but the team are likely getting their heads down to drive for a 2019 release, and the more they show of the game, the fewer surprises there are to find when we play it. I have watched the fascinating videos of this four-dimensional puzzle game so many times and I still don’t really understand what’s going on. That hasn’t dampened my enthusiasm for it, though. The game has been in development for about a decade, but a message earlier in 2018 confirms that it’s still being worked on. In fact, the levels are locked in and the game is in polish phase. Fingers crossed for 2019. This beautiful puzzle game looks like it's going to miss the planned 2018 launch window, but I look forward to exploring the game's warped architecture. Manifold Garden is set in Escher-esque mazes where gravity can shift and change your angle of approach to the world. 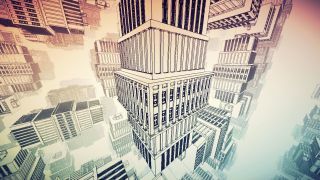 Creator William Chyr invites us to "witness infinity in first-person, and its rules to solve physics-defying puzzles". Sounds great to me. The above tech demo is all we've seen of Halo: Infinite so far. Will it be an open world shooter, or another typical structured Halo campaign? The good news is that it's definitely coming to PC. In a recent livestream 343 said that the engine has been built with both PC and consoles in mind. A beta, called the 'Fighting Program' is planned, so we'll learn more then, meanwhile here's everything we know so far. This game's still a rumour, but fans expected official hints or even a full reveal at this year's Blizzcon. Hundreds of thousands of Diablo fans directed their ire at the DIablo Immortal mobile game that Blizzard announced instead. The cinematic trailer has 708,000 downvotes, but at least that shows there's plenty of passion out there for another big entry in the series. Kotaku has reported that the project's been rebooted a few times and the current iteration is takes a darker tone than Diablo 3. Exciting if true. Back in 2015 we saw impressive footage of destructible terrain in Crackdown 3, since then very little has been shown, but since then the game seems to have slipped off everyone's radar. It's due out in February next year and just recently IGN showed the campaign footage above. It looks like big dumb fun, which is what the series is known for, though that destructibility we saw years ago is limited to the multiplayer mode, presumably to stop you from flatting the entire city in an hour in singleplayer, thus essentially destroying the game for yourself. I'd still like that option, though. The Fig-funded RPG sequel looked great in 2016 but, except for some snippets, no further videos have been posted since on the InExile account. The dev blog has been ticking along, but little of much substance has been shown. A new Platinum game coming to PC is a massive deal, but it doesn't feel like that right now because beyond the mysterious cinematic E3 trailer, there's nothing out there. It looks Soulsy, I guess? It looks like it will be set someplace called Helos Empire, and you can wield special energy called the Oversoul. A goddess called Gaia has turned on mankind and a group called the Nomads needs to fight back and give humanity another chance. Who knows what that entails, but it's probably going to end badly for Babylon. For more of a comprehensive look ahead at the future of PC gaming, browse our massive roundup of the new games of 2019.